N.B. You can search this page to find a specific word or words such as BUTTRESS by using the Find command in the top tool bar under "Edit." ABACUS In Greek and Roman orders, the architrave rests on the abacus, a square flat stone on top of a capital. ACANTHUS An ornament based on the broad-leafed acanthus plant found in the Mediterranean; part of the Corinthian and Composite orders. ACROTERION A base, upon which an ornament may or may not be positioned, placed on the three angles of a pediment. The ornament may also be called an acroterion. ANTA The end of a wall decorated by a pilaster. Columns in antis are columns between two antae, a customary arrangement for porticoes. ANTEFIX A vertical ornament placed above the building’s eaves. APSE A semicircular or polygonal project ion on a church; oft en found iii the east end, beyond the chancel or sanctuary. ARCADE A number of arches supported on columns or piers. A flat or blind arcade is applied to a wall to articulate the surface. ARCH A device, usually in stone or brick, that spans an opening in a curved or pointed formation. ARCHITRAVE The lowest sect ion of the entablature; also, a moulded frame around a door or window. ARCUATED A description of a building incorporating arches. ASTRAGAL A small convex moulding that may look like a reed if found in vertical rows. BALLOONWORK Timber-frame construct ion, in which upright studs run from sill to eaves amid horizontal pieces are nailed to them. BALUSTRADE A railing with posts or balusters and a handrail. BARGEBOARD or VERGEBOARD Decorative woodwork or gingerbread attached to the projecting rafters of a gable roof. BAY WINDOW A window that projects out from the main wall. It may cover more than one storey, and may be curved, square, or canted. BELLCOTE A frame of stone or wood to hold bells, often located at the church’s west end. BOSS An ornament projecting from the intersection of a vault ‘s ribs. BUTTRESS A vertical projection, usually of stone or brick, that is applied to a wall to stabilize the forces exerted outwards by a vault or an arch. CAMPANILE Bell tower originating in Italy and favoured in Canadian villas in the mid 19th century. CAPITAL The top part of a column or pilaster. Its features are often determined by its classical order. CASEMENT A window that opens by hinges on one side. CHAMFER A bevelled surface at an edge or corner, usually at an angle of 45 degrees to the other two surfaces. CHANCEL Traditionally found in the church’s east end, an area reserved for the clergy and housing the altar. CHIMNEY-PIECE A mantelpiece, usually of wood or marble, that surrounds the sides and top of a fireplace opening. CHIMNEY-STACK An upright structure in stone or brick, containing flues and rising above the roof. CLERESTOREY The upper part of the church’s nave above the aisle roofs, with windows. COLONNADE A row of columns supporting an entablature. COLONNETTE A very reduced column. COLUMN A vertical supporting post, usually composed of a base, a shaft, and a capital. COPING A protective, sloping capping to a wall. CORBEL A carved or moulded supporting stone that projects from the wait surface. CORNICE The top portion of the entablature: also, the crowning projection that finishes a wall, a window, or a door. COURSE A continuous horizontal layer of brick, stone, etc., in a building. COVE A large concave moulding. CRENELLATED A notched parapet, usually associated with fortifying a medieval building; also known as a battlement. CUPOLA A small domed lantern or turret on a roof. 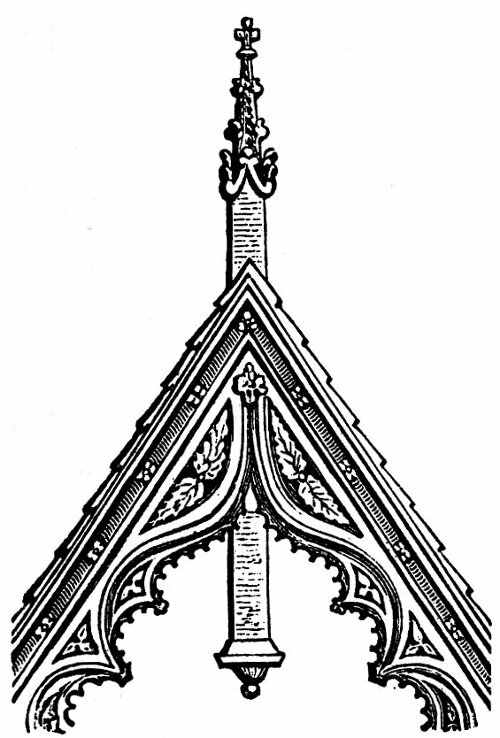 CUSP The point formed by the intersection of two foils in Gothic tracery. DENTILS Small rectangular blocks ornamenting the underside of a cornice. DOME Often a hemispherical covering rising from a roof; may be surmounted by a cupola and may be raised over a circular or polygonal drum. This drum is frequently pierced by openings or windows. ECHINUS The convex moulding that supports the abacus on a capital. 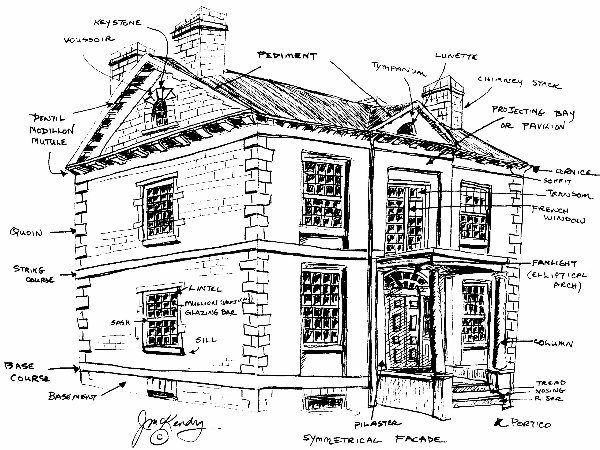 ELEVATION A drawing or photograph that shows one face of a building. ENGAGED or ATTACHED COLUMN A column applied to a wall. ENTABLATURE A horizontal arrangement of architrave, frieze, and cornice that is supported by columns or found on a wall. FACADE The face or front of a building. FENESTRATION The arrangement of windows. FIELDED PANEL A panel with a central raised port ion. FILLET A square profile moulding. FINIAL An ornament rising from the peak of a pinnacle, spire, gable, etc. FLUTING Ornament composed of a series of parallel concave mouldings, often found on column shafts. 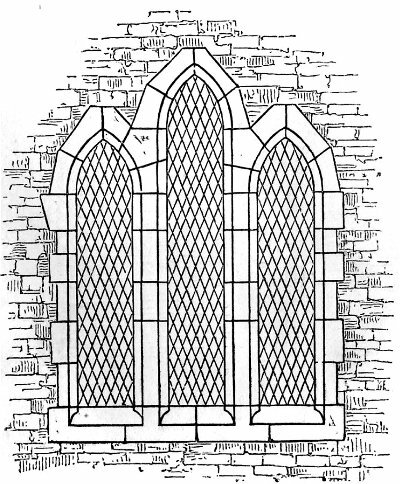 FOIL In Gothic window tracery, the small arc openings separated by cusps. The number of foils is described as trefoil (3), quatrefoil (4), and cinquefoil (5). FRENCH WINDOW A window that opens to the floor in two hinged parts. FRIEZE The portion of an entablature between the architrave and the cornice: a decorative band. FRONTISPIECE The principal bay of a building. GIANT or COLOSSAL ORDER A column or pilaster extending beyond one storey. GLAZING BAR Wooden or lead dividers in a window. HIPPED ROOF A roof that slopes on all four sides. HOOD-MOULD A moulding that is applied over a window to throw off rainwater, especially in medieval architecture. JAMB The vertical side of a fireplace opening, doorway, window, etc. KEYSTONE The central stone or brick in an arch. LABEL STOP An ornament terminating a hood-mould. 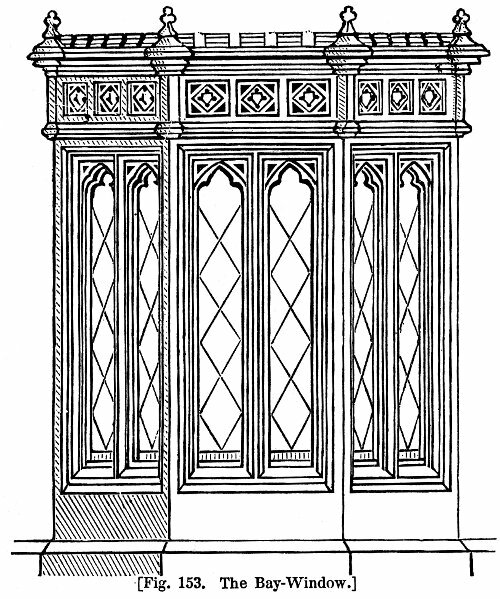 LANCET A tall, narrow pointed window, often found in threes, fives, or sevens on a church’s end walls. LINTEL The horizontal member that spans an opening. MACHICOLATION Part of a defence system a castle, in particular a projecting parapet with openings in the floor between corbels. 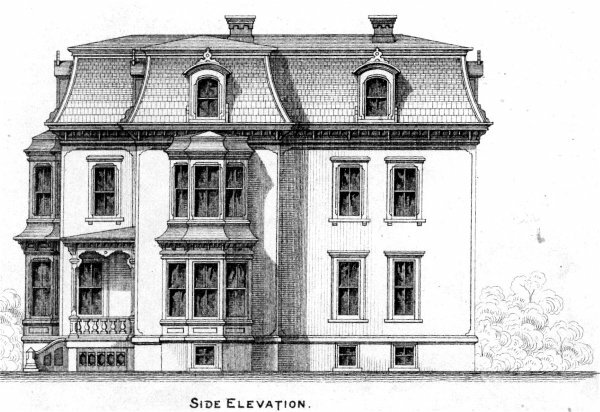 MANSARD ROOF A roof with a double slope — the lower is longer and sleeper. MERLON The raised part of an indented parapet or battlement. METOPE A plain or decorated space between triglyphs in a Doric frieze. MOUCHETTE A motif resembling a curved dragger, in Gothic tracery of the curvilinear style. MULLION A vertical divider in a window. NARTHEX The entrance hall that stretches across the church’s main entrance. NAVE The principal room in a church for the congregation. NEWEL The main post from which the steps of a stair rise. One end of a handrail is usually attached to the newel. OCULUS A small round or oval window. 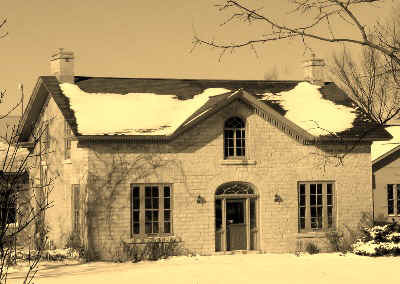 'ONTARIO COTTAGE' A modern term used to describe houses in Ontario from about 1830 to about 1870 if they are built with one-and-a-half storeys and have a gable roof featuring a gable over a dormer window; the later often with a round arch; there is typically a central door (often with a transom light and sidelights) and balancing windows. Although deemed a "cottage," it may be a farmhouse or a house in a village, town or city. 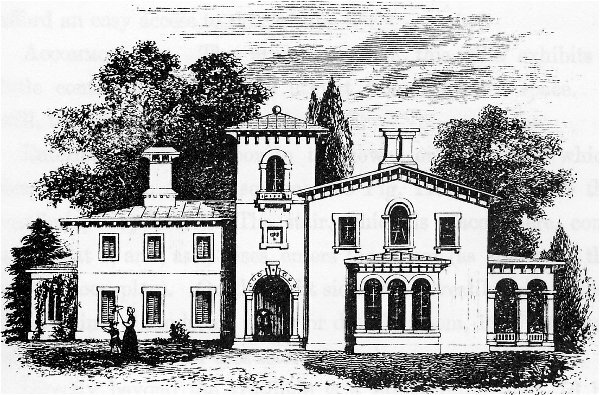 American writer Andrew Jackson Downing, 1815-1852 (Cottage Residences 1842 and the Architecture of Country Houses 1850) used the term "cottage" loosely to suggest a house of modest pretensions and "villa" for a more grand house but was not adverse to combining them as in "a cottage villa." An important point is that our use today of cottage as a seasonal building, usually by a lake and as a secondary dwelling in addition to a year-round house, is not what is meant here. 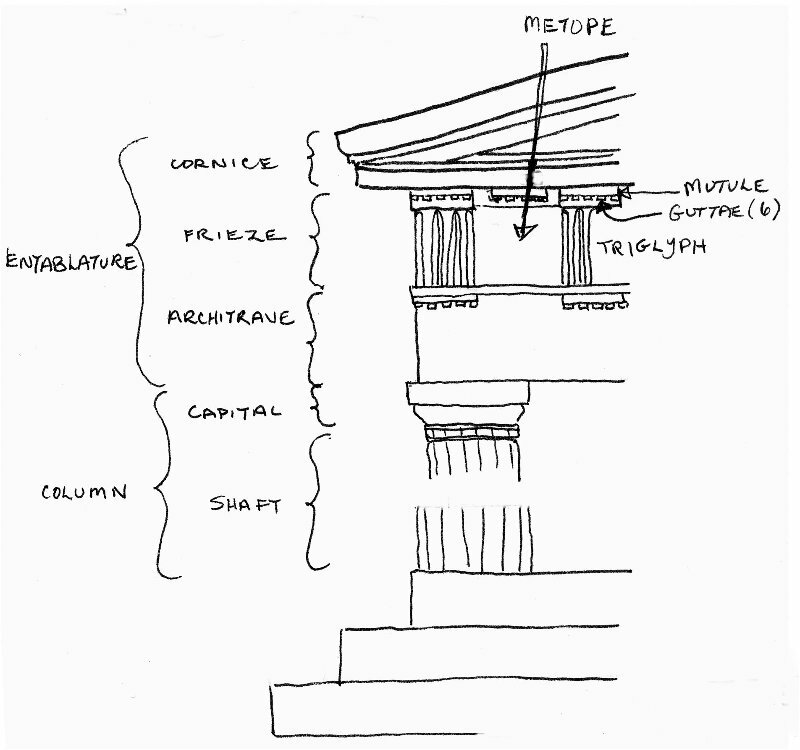 ORDER In classical architecture, the column and entablature. 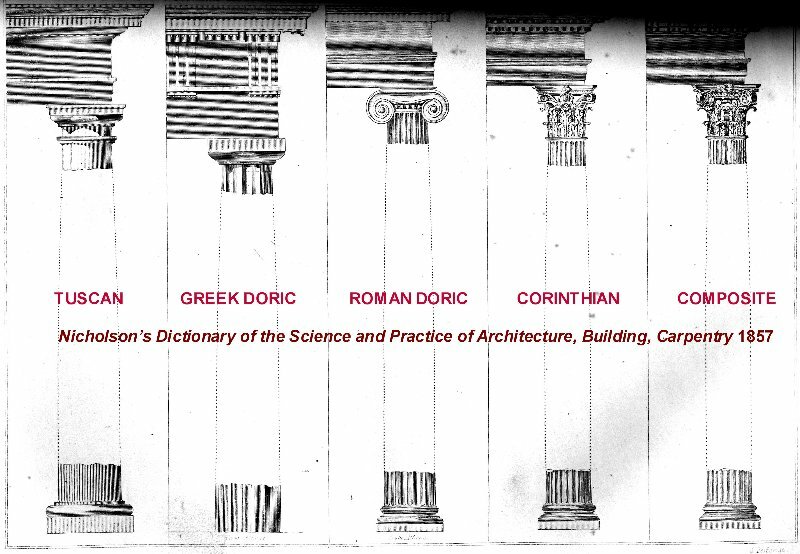 There are five main orders, each with their own ornaments, proportions, and measurements: Tuscan, Greek Doric (and Roman Doric), lonic, Corinthian, and Composite. They are listed in degrees of elaborateness, Tuscan being the simplest. ORIEL window A bay window projecting from an upper storey. 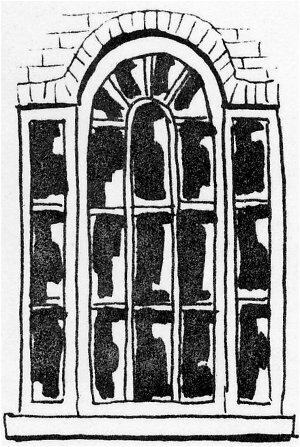 PALLADIAN or VENETIAN WINDOW (drawing at right) A window consisting of an arch (often curved) supported by columns whose entablatures span narrower side openings. Ultimately derived from the designs of Andrea Palladio, a sixteenth-century architect working in Venice and the Veneto. PARAPET A low wall on a balcony or above the cornice of a building. PARGETING Plasterwork, incised or modelled with ornamental patterns, on a building’s exterior walls. PEDIMENT A gable finished with a horizontal moulding between the two lower corners, ultimately derived from Greek temples. A broken pediment has this horizontal moulding partially left open. PENDANT An elongated and often turned ornament that hangs down from a peak or cornice, for example, on a gable of a medieval-styled building. PIANO NOBILE The principal storey, containing the reception rooms and raised above the ground storey, in a building of the classical style. PIER A square or rectangular post or pillar. PILASTER A rectangular column applied to a wall and usually in a classical order. PINNACLE A conical ornament surmounting a gable or buttress in medieval architecture. PORTE-COCHÈRE A porch or portico designed to admit a carriage. PORTICO A porch with columns and usually a pediment. PROPYLAEUM An entrance gateway to au enclosure, especially in Greek and Roman architecture. QUOIN The cornerstones, often emphasized, on a building. Usually of stone or brick hut may also be wood imitating stone. REEDING Ornament created by a series of parallel convex mouldings. RETABLE or REREDOS The screen or decorative wall treatment behind a church’s altar. REVEAL The inside surface of a doorway or window opening, usually the thickness of a wall. ROTUNDA An internal space, perhaps domed, round, or oval in plan; often part of the circulation pattern in a building. ROUNDEL A circular panel or decoration. RUSTICATION A term describing how individual blocks or courses of stone are picked out by deep joints and rough surfaces for a formal ornamental effect. SASH WINDOW Double-hung vertically sliding sash or frames. SCOTIA A concave moulding found on a column’s base. SIDELIGHT A window immediately beside a door. 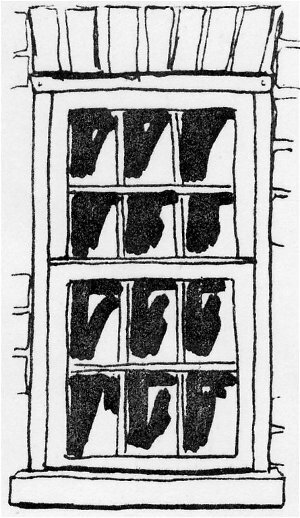 A transom window is a window above a door. A fanlight is a window in the shape of a fan above a door; it may extend over the sidelights. SOFFIT The underside of any architectural feature. SPANDREL The almost triangular area contained by the outer curve of an arch, the horizontal line drawn from its apex, and the vertical line drawn from its springing. STRING COURSE A band running horizontally across a facade. It often marks, on the exterior, the internal floor levels. TORUS A pronounced convex moulding. 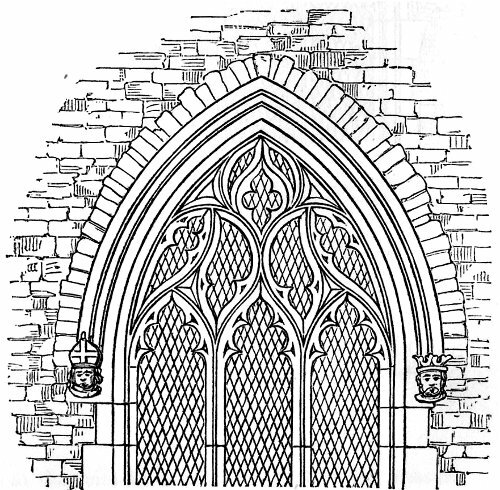 TRACERY Dividing bars, often forming ornamental patterns, in a Gothic window. TRANSEPT The transverse arm of a cruciform church. 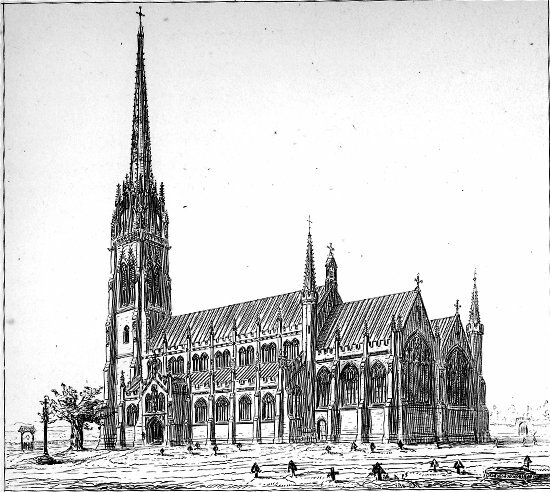 The nave and the transepts intersect at the crossing. TRIGLYPH A rectangular block between metopes in a Doric frieze usually ornamented by vertical grooves. VESTRY A room attached to a church, where the clergy and choir robe in religious garments. VOUSSOIR Wedge-shaped stones or bricks in an arch; the centre one is the keystone. WAINSCOT Wood paneling or boards part way up a wall from the floor.